BlackBerry Bold 9650 Officially Announced! Today at WES 2010 in Orlando, RIM has finally announced that the long awaited Bold 9650 will be coming to North American networks in early May. The device will support 3G and have both Wifi and an optical trackpad. As expected, the device will also be rocking a full 512 MB of flash memory, which should allow for OS 6 down to fly when it gets released down the road. No official date just yet, but we should know more in the coming weeks. Hit the jump for the full release. Waterloo, ON - Research In Motion (RIM) (Nasdaq: RIMM; TSX: RIM) today introduced the BlackBerry Bold 9650 smartphone - the latest addition to the BlackBerry Bold portfolio of premium smartphones. Sophisticated, powerful and feature-rich, the BlackBerry Bold 9650 is a global smartphone for CDMA customers who want to stay connected, productive and entertained. "The new BlackBerry Bold 9650 is an extraordinary smartphone that we think customers will love," said Mike Lazaridis, President and Co-CEO at Research In Motion. "Whether at work or at play, the new BlackBerry Bold 9650 offers a truly impressive communications, multimedia and connectivity experience." 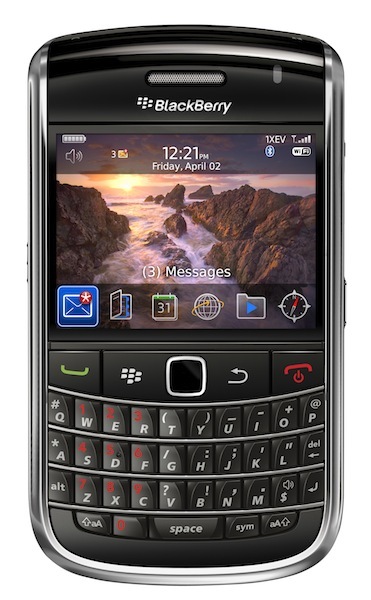 The BlackBerry Bold 9650 fuses form and function in a striking design and, in addition to providing premium phone and multimedia features, it of course delivers the industry's leading mobile solution for email, messaging (IM, SMS, MMS) and social networking.